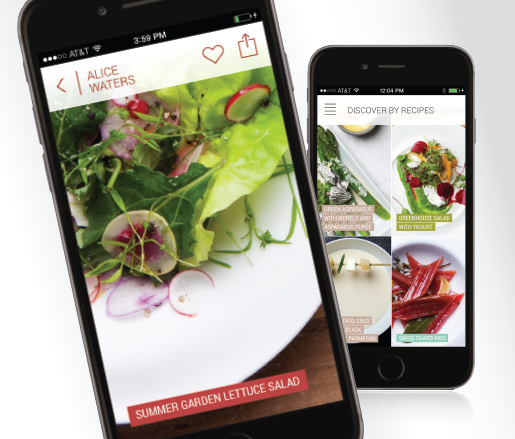 The inaugural James Beard Foundation app features an array of innovative, inspiring vegetable recipes by JBF Outstanding Chef award winners like Daniel Boulud, Alice Waters, Thomas Keller, and many others. Stunning step-by-step, high-definition images and short videos show food lovers how to transform even a simple carrot into an exciting, restaurant-worthy dish. From purchasing to plating, the interactive app seamlessly guides users through every step necessary to create timeless dishes from some of the industry’s top toques. Additional features include built-in cooking timers, sharing capabilities, and a shopping section to purchase just the right tools for the recipe. Perfect for novices and seasoned cooks alike, the app brings JBF Award–winning chefs into your kitchen! Available now in the Apple App Store—and absolutely FREE for JBF members. 1. Download the app from the App Store using the link above. Once downloaded, click on the JBF Vegetables icon on your phone. 2. Open the app's main menu in the upper left corner and click on the login button on the bottom of the menu. 3. On the login screen, click the "reset password" link. 4. On the next screen, enter the email address associated with your JBF membership, submit, and check your email for a message titled "reset password for kinetic art." 5. Follow the instructions and enjoy free, full access to the app! * JBF Vegetables features vegetable recipes and outtakes from The James Beard Foundation's Best of the Best cookbook by Kit Wohl, as well as original content including step-by-step photographs and videos.